The Buckhorn Lodge Retreat in Park Falls is a beautiful newly remodeled spacious privately-owned vacation retreat. The great room has plenty of space to relax with Knotty pine walls, a corner fireplace and much more add to the rustic charm. It comfortably sleeps 12 offering 2 Queen Beds, 2 Full and 2 Queen Futons which are oversized and thick for added comfort. Offering all the conveniences of home including 2 Full baths with all linens provided, a fully stocked kitchen including dishwasher and 2 refrigerators. The sun porch has large windows for viewing the wildlife and a large table for game playing. Enjoy the outdoors in the large backyard or on the massive deck which is great for family grilling or use the outdoor fire pit for hours of campfire fun. 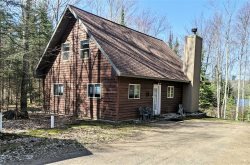 You'll enjoy the serenity and fresh clean air on your private retreat of 26 acres that's tucked within the Chequamegon National Forest which has trail 105 access for ATV & Snowmobiling right out your back door. Also, great for hiking, biking with canoe/kayak landings and fishing all within a stone’s throw away. Although you will be semi-secluded among the pines, the added fun of shopping, golfing, skiing, casinos and many restaurants with Northern Wisconsin hospitality are all only a short drive away. Rates listed are based on up to 4 people. To book for 5 or more, choose the appropriate options when booking online.